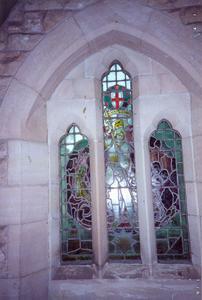 In the porch a three pane stained glass window depicting St George slaying the dragon. There is an inscription of SAINT GEORGE with the Badge of the Cheshire Regiment below it. SAINT GEORGE / IN LOVING MEMORY OF WILLIAM RICHARD FERDINAND THOMAS, LIEUT. THE CHESHIRE REG. DIED JUNE 5TH 1942 "HIS DUTY DONE"